Puerto Ricans have helped build this great country over the past few hundred years. They are as much a part of American history as any ethnic group, minority or majority. 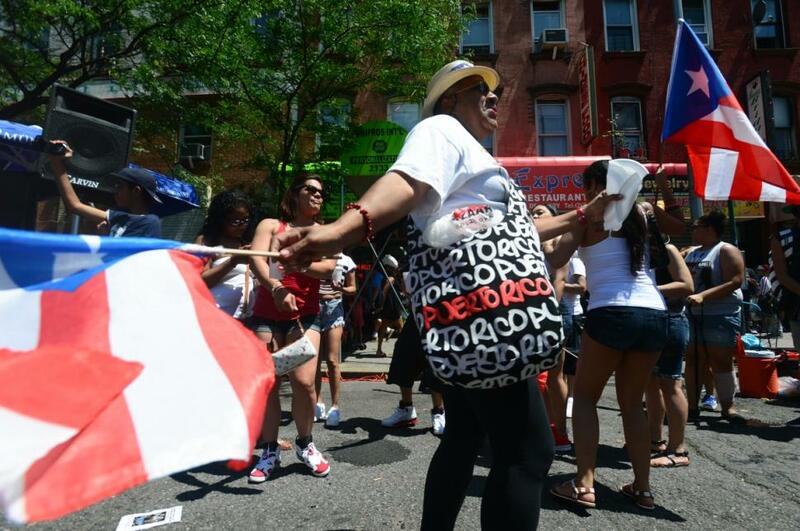 In this, the last of a 4 part series on the history of Puerto Ricans in America and New York City, we examine the rich, distinguished, revered traditional culture of the Puerto Rican people as it has adapted over the years. The Puerto Rican people embrace their family traditions and customs, passing them from generation to generation, though as young people increasingly move into the American culture, these traditions and many others seem to be waning slowly. In the celebration of holidays such as Thanksgiving, Christmas, New Year’s Day and Puerto Rican Day, lies the time when Puerto Rican families come together with such love and warmth. Puerto Rican people are famous for throwing big, elaborate parties, filled with music and dancing to celebrate special events. They sing, dance and eat traditional foods. Many Puerto Rican dishes are seasoned with a savory mixture of spices known as sofrito.This is made by grinding fresh garlic, seasoned salt, green peppers, cilantro, oregano, and onions in a pilón, a wooden bowl similar to a mortar and pestle, and then sautéing the mixture in hot olive oil. This serves as the spice base for many soups and other dishes. Asopao, which is a stew made with vegetables, rice, and meat or fish, is extremely delicious. A typical meal would usually consist of a heaping pile of rice served with gandules (pidgeon peas), chick peas, red, white, or pink beans. Sometimes fried pork chops, fried chicken or a favorite, biftec encebollado (pieces of beef sliced thin sautéed with onions), can also be added. Of course no traditional meal is complete until you serve tostones (dry, fried plantains seasoned with salt) or amarillos (fried sweet plantains) with the finishing touch of a salad. Puerto Rican cuisine has such a large variety of styles and flavors, among which is included “El Mofongo.” This popular item is a mashed plantain served with either fish or meat inside. I usually add crumbled fried bacon with onions and garlic sautéed in the bacon fat with a little salt and pepper. Then there are the “empanadillas” (dough filled with seasoned meat, seafood or ham and cheese). Sorullitos de maiz (fried sticks of ground corn) are also a favorite in the Puerto Rican cuisine. No meal is complete without a delicious dessert, such as “flan” (egg custard) or arroz con dulce (rice pudding), topped off with a steamy cup of coffee served with boiled milk and sugar to taste. The majority of Puerto Ricans that lived in Spanish Harlem were Roman Catholics, though there were some that practiced “Santería.” This is “a blend of Catholicism and the religion of the Yoruba people who were brought to the Caribbean as slaves.” (J. Tolles) The churches which they attended included St. Francis De Sales Roman Catholic Church at 135 East 96th St., St. Cecilia located in the heart of El Barrio at 220 East 106th Street, Iglesia Metodista Episcopal at 1664 Madison Avenue, and Our Lady of the Miraculous Medal, 77 St. Nicholas Avenue. The one custom that is very meaningful to the Puerto Rican community happens when parents and grandparents bless their children with “La Bendicion.” In addition, rosaries, busts of La Virgin (the Virgin Mary) and other religious icons have a prominent place in the household. In their determination to excel, Puerto Ricans and their descendants no longer wish to stay at the bottom of America’s economic ladder, they have worked toward self-improvement. This strength in character and the pursuit of a higher education has led to a new role as leading and productive citizens in American society. Today many Puerto Ricans are successful business people, political figures, doctors, nurses, actors and actresses, writers, historians, inventors, defenders of women’s rights, musicians, opera singers, composers, teachers and much, much more. One of the most gratifying moments for the Puerto Rican community was to witness the appointment of Sonia Maria Sotomayor as she became an Associate Justice of the Supreme Court of the United States. After all, as a proud people with a storied heritage, Puerto Ricans should always remember where they have come from, because they’ve helped America gain the great status that it enjoys today.